It was the summer of 2007, and we were planning a very different summer for our son Cory who was entering the 8th grade that September. He was to travel to South Africa for a friend’s Bar Mitzvah and have a three-week vacation there complete with safari, tennis, beach and more. Two days into the trip there was a motor vehicle accident and Cory was badly injured—a high level spinal cord injury. Life would forever change for all of us and mostly for Cory. This story focuses not on Cory’s journey which has been and continues to be inspirational, but on the embrace and response of the SAR community. During the four weeks in South Africa in the ICU, we were told of the many community gatherings where tehillim was said for Cory’s refuah. There was one at our shul, the Young Israel of Scarsdale, and there was yet another at SAR. I am told both were attended by scores of people, friends we knew, friends we had yet to meet, and strangers praying on Cory’s behalf. I believe very deeply that the power of that davening helped beyond measure. When we were finally able to return to the states four weeks after the accident, the wheels of the medevac plane touched down at Teterboro and we were immediately transported to Columbia Presbyterian Hospital. As the double doors opened and the stretcher was wheeled into the hospital we were greeted by Rabbi Krauss and Rabbi Harcsztark. An act of chesed that spoke volumes about the embrace we were to experience from the SAR community. During the five months in rehab, Cory had regular and frequent visits from his SAR chevra. The parents came together and made a schedule—Adrienne Cooper would be gatekeeper to manage the flow of visitors, parents (Nancy Lerea, Randi Carrey, Shoshana Noble, and others) would alternate driving the hour and a half to south Jersey, still others would arrange the food. Cory’s classmates would come to share news, class happenings, sports updates, and so much more to make sure that Cory would feel the embrace of his friends. 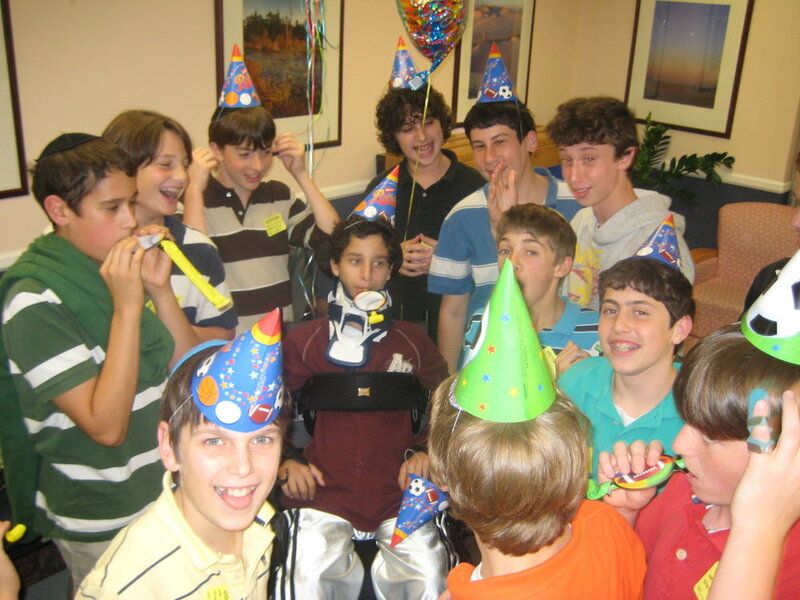 The acts of friendship and genuine concern were numerous; while at rehab they made him a memorable 14th birthday party, built a sukkah on the premises, stayed for one shabbat (when he read his Bar Mitzvah parsha), made sure that he had entertainment with DVDs of movies and comedies to keep him occupied and smiling. The SAR teachers worked with the rehab tutors to provide the right materials for the 8th grade curriculum but that would not be all. We had regular visits from Michele Saks his math teacher who came equipped with a white board in hopes that Cory might be able to use that, Lauryn Weiser came and made sure he had the right reading materials and Rabbi Drelich was a regular with inspiring words of Torah. We returned to SAR in December for a trial run—Cory was on a day trip from the rehab center with myself and a member of their physical therapy staff. The SAR staff would be briefed on appropriate wheelchair etiquette and some medical insights regarding paralysis. The students would greet Cory and the entire school would engage in a community artwork project “כל ישראל ערבים זה לזה,” “All of Israel is responsible for one another.” That artwork still hangs in the atrium of the Academy. Cory went on to be the 8th grade class representative at graduation in June. 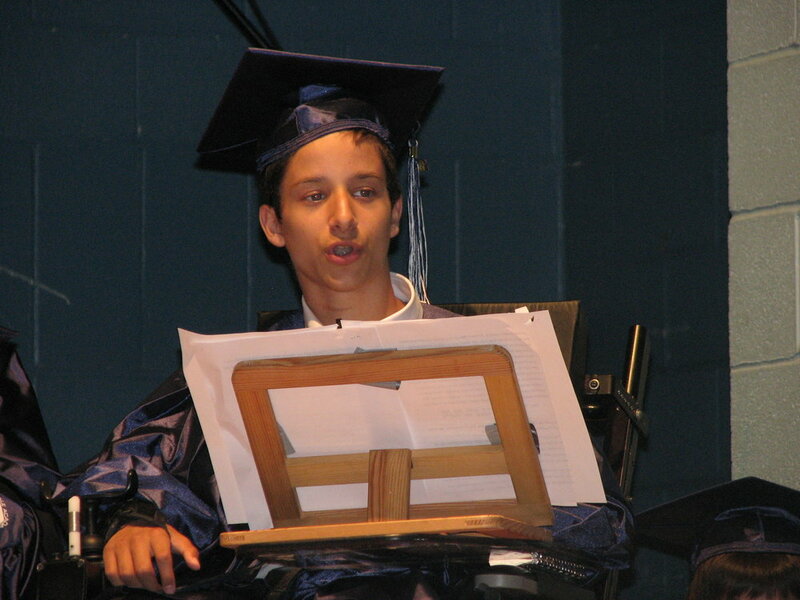 Although I am not actually sure if he completed the school curriculum, I believe his journey and the challenging personal curriculum he faced and mastered, earned him the right to move on to high school. At SAR High School the embracing moments continued as did our challenges. The tech crew found apps (that was before apps were very widely available) that might enable Cory to take notes or make computations. They also opened the classroom through livestream technology so that on days when Cory couldn’t make it to school, he could ‘attend’ class. Russi Bohm and Cory started at SAR High School the same year. There are no words to describe her care and her medical expertise. We are forever grateful to her for making high school possible. Cory was blessed with an amazing line-up of teachers who went above and beyond to make sure his high school education was challenging yet doable. Amanda Elbogen, Danielle Goldstein, Tamar Krieger, Rabbi Hollander, just to name a few. His college experience in the west coast was really due in part to a phone call he got from Amanda. She was touring Law Schools after two years and many hours with Cory. She called him from the Stanford campus where she was interviewing, and told Cory “YOU MUST GO HERE!”—the weather and the terrain are perfect for you. 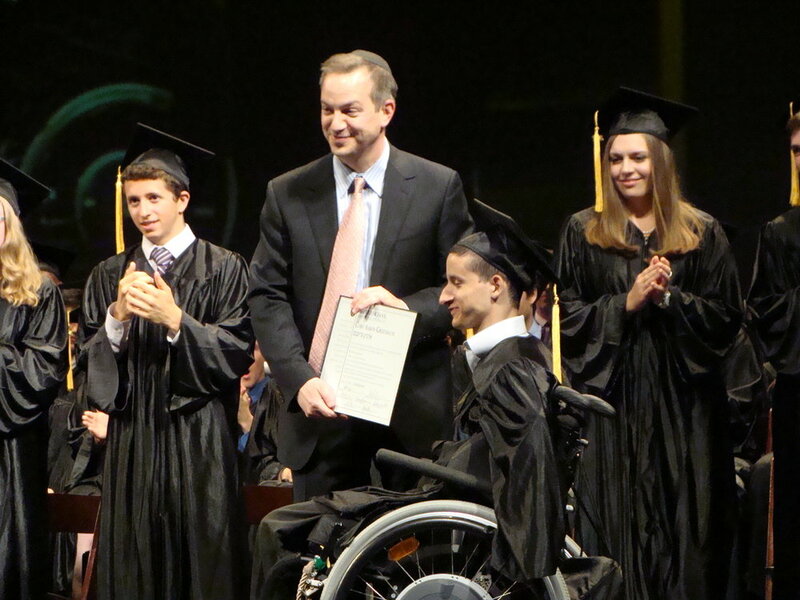 And so he did, thanks to the wonderful care, education, and attention of the SAR community—and of course, to Marge Jacobs and Michael Courtney, who held our hands during the college planning process. Cory’s story continues to evolve but the SAR story is still the same. Each and every student is worthy of the investment of time, energy, talent, and care. Especially those who fall on very tough times. Our Hakarat Hatov is immeasurable. I know the work I do for SAR in the Development Office is truly holy work. Thank you to all of those both of who are known to our family, and those that are not, for making our journey easier and with more light than one could possibly have hoped for.